The following is an article by Bob Raissman that appeared in the New York Daily News on June 4, 2006. Mike Tyson will return to the ring in August-sort of. In what could be the beginning of a new career for the former undisputed champion, Tyson has signed on to work ringside as a TV analyst for the international broadcast of Hasim Rahman’s August 12 WBC heavyweight title defense against Oleg Maskev. Interestingly, it was Tyson who reached out for the broadcasting gig. According to Top Rank boss Bob Arum, who is promoting the Rahman-Maskev rumble, Tyson put what amounted to a “position wanted” ad on BoxingTalk.com, a fistic Web site. Arum said he quickly picked up on Tyson’s message and contacted Greg Leon, a friend of the former champ who is the publisher of BoxingTalk. It won’t be the first time Tyson plays analyst. 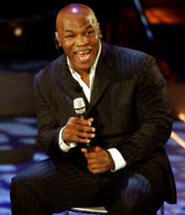 In May 1995, a month after he was released from prison, Tyson joined Showtime’s broadcast team ( Steve Albert, Bobby Czyz, Ferdie Pacheco) to work the Vincent Pettway-Simon Brown fight from Washington, D.C.
Tyson’s trip back to the microphone comes at a very opportune time. With Comcast on the verge of getting into the boxing business, there could be an analyst spot open for a marquee personality such as Tyson. While Tyson’s speaking voice will never be mistaken for that of James Earl Jones, there is no doubting his knowledge of the sport, especially boxing history. Still, if he is serious about broadcasting, Tyson will have to make a commitment. And that has never been easy for him. Arum doubts Tyson, who last fought a year ago, will ever fight again.